BaaS (Backend as a Service) platform for fast and agile software development. Ideal for front-end and mobile developers who need comprehensive backend. Startups can now get to stable working MVPs very fast. Extendable platform. Custom services within the same infrastructure to fulfill individual cases. Adaptable. Combines with other world-renowned service platforms and toolboxes. - You choose which services you need/want. - Have specific needs? We develop custom, tailor-made services for you. - Scalable support levels. Get as much, or as little, support you need. Gives you control over your services. A simple and intuitive monitoring tool. Continuous innovation - With REQSTER SaaS platform your business can seamlessly and frequently be upgraded to provide a steady stream of new features and enhancements without disrupting day-to-day operations. Be available - Make your store mobile using REQSTER Android and iOS SDK and connect with shoppers anytime, anywhere. Be fast - Go to market faster and expand into different regions and countries in record time. 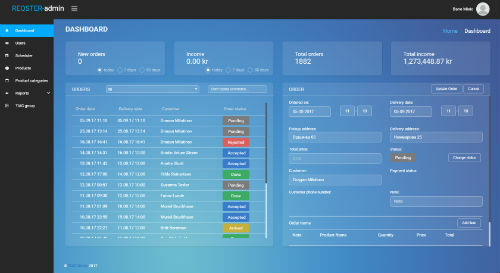 Be in line - Monitoring of all business operations using REQSTER Dashboard. Stay focused - Leave business software administration to experts and focus exclusively on your niche market. Know your expenses - With REQSTER’s simple and predictable monthly fee plan, you always know where you stand. Get there fast - Make your CRM software up and running in no time. Using REQSTER your platform can be ready 50% faster than using traditional software development methods. Be Agile - Achieve business agility by taking advantage of REQSTER’s scalability. No need for managing expensive IT infrastructures in order to keep up with growth predictions. Improve constantly – Get upgrades and improvements without any disruptions to your business. Worry less - With REQSTER you don’t have to worry about security of your valuable data. Read REQSTER’s Swagger documentation and see what services we offer. If you didn’t find what you are looking for, ask us - we can develop what you need. Implement services either by using direct calls or by using one of REQSTER’s native mobile libraries. Start on staging instance and later switch to production. Send us your request for access to REQSTER platform. © 2017 TIAC d.o.o. All rights reserved.